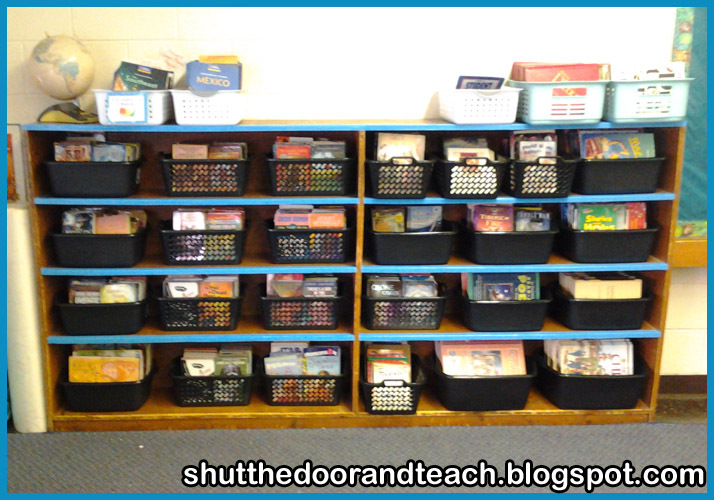 Setting up your classroom library is one of those tasks most elementary teachers do over the summer. 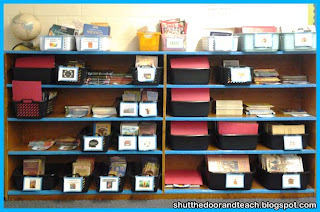 They come in on one of their vacation days and sweat it out for a few hours in order to get books into baskets with cute tags to label them so that when the children arrive, it's all set up ready for browsing. On the other hand, I have my students sort our library! I do go in over the summer to make my library look very neat (just not organized). I actually just replaced some of my baskets this year to make the library look neater. 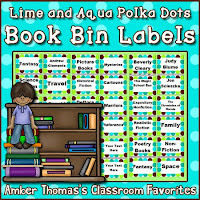 I also have lots of book bin labels ready made at the start of the year. So some years I might use the "C.S. Lewis" label but other years I might use the "Chronicles of Narnia" label and the author label stays filed away for another year. 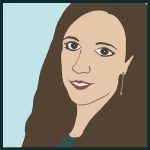 But if a couple new labels need making based on their ideas once they get started I do it! 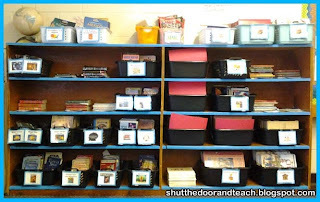 We talk about 4 ways to organize: Series, Author, Genre, and Topic. They come to fourth grade knowing a LOT about genres so all I do is a quick refresher on using text features like pictures, clues in the title, and skimming the back cover. Next I put a basket of books at each group with a packet of small Post It Notes.The kids go through the basket and make piles on their desks with the labels, and I go around taking piles and laying them on the shelf out of their way. When a group is almost finished I drop another basket off at their desk. In order to ensure a higher success rate I do tend to make sure that there are some "like" books in each basket. 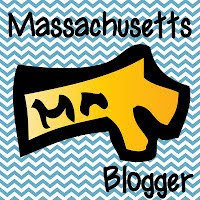 For example, I might have 7 A to Z Mysteries, 5 Beverly Cleary books, and 8 nonfiction in a basket along with a few "other." After all, when they are packed up, like books are near each other anyway, so it's not much extra work just to check and make a few adjustments. If we can't get it all finished in one day (I do this activity at the end of the day) I leave one basket at each group so they have something to browse through during their "I'm Done, Now What" time the next day. The remaining unsorted baskets go back on the shelf with a red card inside, so they know at a glance what's left. 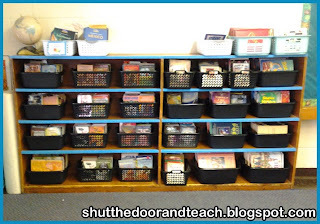 Before I add my colorful book bin labels I usually make a few changes once they go home in order to have the right amount of baskets and space, but it really helps the kids become familiar with what I have available to read and where to find it from the very start. It gets kids interacting with the baskets instead of approaching them with a sense of not being sure where to start. Taking the role of facilitator instead of provider when it comes to organizing the library also helps those kids who get stuck in a "reading rut" and visit the same old book basket again and again, hoping that another book from their favorites series will magically appear. And for a handful of kids, it gets them excited to find a new, different book. They'll ask me, "I know this is a fantasy book, but instead of putting it in the basket am I allowed to keep it?" What better way to get kids reading than to make them beg for it? ;) So even though our district adopted a basal program a few years ago, I still make time at the beginning of the year to let them be the ones to organize the books they'll be choosing to read. 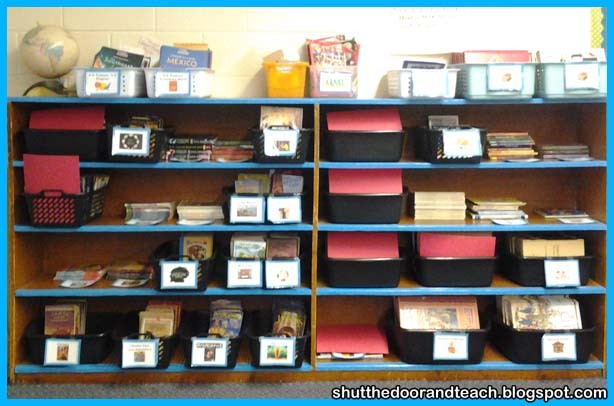 How do you help your students take ownership over their classroom library?